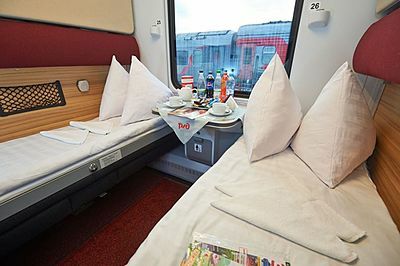 Nice - Moscow train, Buy Nice - Moscow train tickets online quickly and easily. Moscow - Nice train has been operating from September 23rd, 2010. Prior to this, there was train connection between Russia and the French Riviera only in tsarist Russia. In 2015, to mark the 150th anniversary of railway connection between France and Russia the train was considerably upgraded. 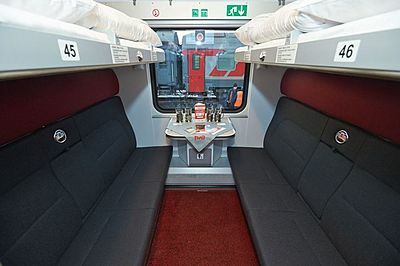 Moscow to Nice train has RIC type carriages (Reglamento Internazionale delle Carrozze). VIP 1st class carriages contain 4 double-occupancy sleeping compartments. Each compartment has two beds on different levels. The lower bed is 110 cm wide. Each compartment has a private bathroom and shower. 2nd class carriages have 8 wide quad-occupancy sleeping compartments (2 lower and 2 upper beds). All carriages are air-conditiond. Every carriage has a shower cabin. Compartment doors are equipped with access control system (smart cards), peepholes and safety latches. Vestibule design allows easy access to all platform types, folding step helps to reach high platforms. Carriages are equipped with route panels and electronic boards indicating the carriage number. Moscow to Nice is one of the longest trans-European rail routes. Its length is 3 315 km. 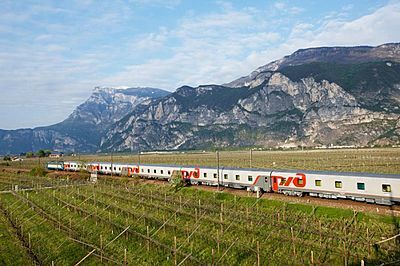 Train route passes through the territories of 8 countries: Russia, Belarus, Poland, Czech Republic, Austria, Italy, Monaco and France. The train’s maximum speed is 200 km/h for European gauge (1435 mm) and 160 km/h for Russian gauge (1520 mm). On Belarus – Poland border the train wheels are changed to fit the different gauge. NOTE: The train crosses Belarus on its route. You will need to receive a Belarus transit visa to cross Belarus!